Pininfarina has become the first company to win the new Silk Road Award at the 2017 China Awards organized by Italy China Foundation. The prize was accpeted by CEO Silvio Pietro Angori during an award ceremony gathering togther companies and institutions, as well as Italian and Chinese personalities, who had best captured the opportunities offered by economic and cultural relations between Italy and China. 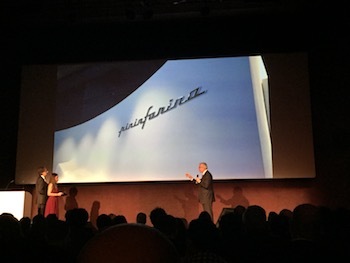 Last March the first Pininfarina architectural project in China was announced. The focus is on Higold Headquarter, a building which will rise in Shunde. Pininfarina Architecture has authored the whole architectural project, from the façade design to the landscape. At the beginning of this year a trade agreement was signed between Pininfarina and Hybrid Kinetic Group Limited was announced. According to the agreement, Pininfarina will support Hybrid Kinetic in the turnkey development of an electric car from the styling concept and development of the vehicle to the engineering development and virtual and physical validation for series production. The collaboration agreement, worth about 65 Million €, will have a total duration of 46 months. The Silk Road award, established in this edition to highlight a highly topical issue, was awarded by an authoritative jury chaired by Cesare Romiti, President of the Italy China Foundation. Pininfarina has been awarded, it is stated in the motivation, "for the long and significant growth path in China, started in the Nineties and continued successfully until the opening of the Shanghai office and the results obtained in recent years. The award is given to Pininfarina also for having established in its development path lasting and profitable relationships with many of the Countries that will be protagonists of the Belt and Road Initiative, dreamed and launched by the Chinese President Xi Jinping". "This new recognition - Angori commented - fills us with pride because it reaffirms the role of Pininfarina as the ambassador of Made in Italy in one of the few automotive markets that is expected to grow steadily over the next few years. Pininfarina was the first Italian company to provide styling and engineering services to Chinese carmakers, back in 1996. Our more than twenty years presence and the great commercial success of the cars we have designed confirm the validity of Pininfarina's growth strategy in the markets of the new Silk Road and the Middle East ". Pininfarina’s business in Asia is now expanding from automotive to architecture and industrial design. Last March the first Pininfarina architectural project in China was announced. 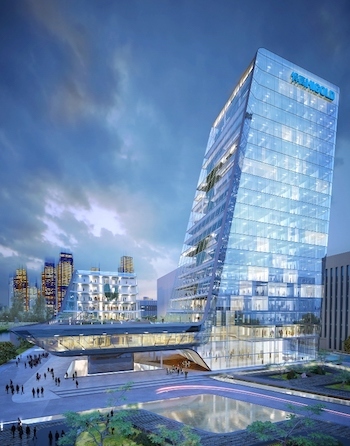 The focus is on Higold Headquarter, a building which will rise in Shunde. Pininfarina Architecture has authored the whole architectural project, from the façade design to the landscape. Pininfarina was the first Italian design house to provide styling and engineering services to Chinese carmakers since 1996. Since then, Pininfarina has expanded its range of activities by developing partnerships with manufacturers like AviChina (Hafei), Chery, Changfeng, Brilliance, BAIC, JAC and others, for which commercially successful vehicles have been designed, such as the DX7, first fruit of the collaboration between Pininfarina and South East Motor-SEM, then followed in 2016 by the DX3, a compact SUV. In 2010 Pininfarina Automotive Engineering Shanghai (PAES) was established with the aim of locating a satellite design development in Shanghai, automotive strategic site for the Asian region. Today PAES is an established outpost of commercial development and design creation that, under the guidance of Simone Tassi (General Manager) and supervision from Italy of the Design Director Carlo Bonzanigo, can count on a multicultural team of thirty people of very high professionalism that give the Chinese headquarters of Pininfarina a strong international character and global vision in the daily challenge to an increasingly demanding market. As a further confirmation of Pininfarina’s commitment on the Chinese market, beginning of this year the signing of a trade agreement between Pininfarina and Hybrid Kinetic Group Limited was announced. According to the agreement, Pininfarina will support Hybrid Kinetic in the turnkey development of an electric car from the styling concept and development of the vehicle to the engineering development and virtual and physical validation for series production. The collaboration agreement, worth about 65 Million €, will have a total duration of 46 months. 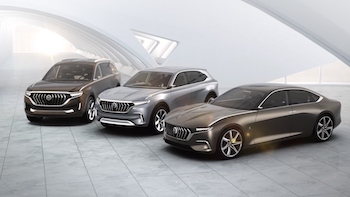 Together with the same client Pininfarina presented at the 2017 Shanghai Auto Show an entire range of environmentally friendly vehicles, demonstrating once again its ability to combine styling research to environmental sustainability: the five seater SUV K550, the seven seater SUV K750 and the luxury sedan H600.